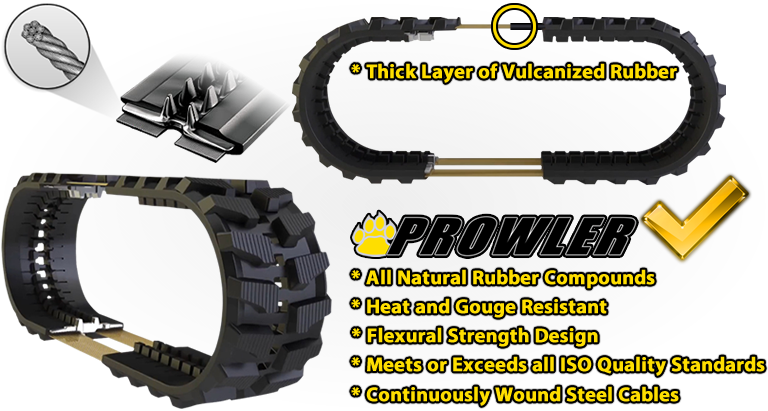 This is a listing for a single Prowler Rubber Track to fit your Bobcat MT52 Mini Skid Steer. The Width, Pitch, and Link Count (i.e. WxPxL) for this Premium Grade Track is 180x72x39 . 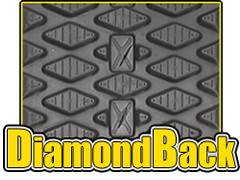 The Diamondback tread design only found at Prowler MFG, is our most Turf Friendly Tread design for both Mini Skid Steer Loaders, and Mini Excavators. Prowler Diamondbacks are much less likely to scar when running at higher speeds or while doing power turns, greatly reducing the risk of damaging someone's yard. One major difference between the Prowler Bobcat MT52 replacement tracks and the competitor is our Flexural Strength Technique (FST) design. The inner circumference is composed of a slightly softer rubber that provides the necessary flexibility needed to prevent abnormal wear and tear from constant flexing and engagement with your Bobcat MT52 undercarriage components. The outer circumference of the track will have a higher durometer rating (harder rubber). This allows the track to be more gouge and abrasion resistant. Click the button below to add the Bobcat MT52 Rubber Track - 180x72x39 Diamondback to your wish list.